“Yes” is the answer, by the way… at least without proper adult guidance. The writer discusses the dangers of a culture where fairytale parodies are being substituted for the originals. “Hoodwinked” is mentioned twice, since we are in the white-hot center of this trend (a trend I groaned about even as I finished the film). Mr. Poniewozik is right on the money. But it’s deflating to have “Hoodwinked” lumped in with the Shrek crowd so easily. For those of you who still might not understand why I am not directing any “Hoodwinked” sequels or similar fare, this is a big reason why. I’d like to think that Red and her friends are teaching your kids some uncynical, real lessons. And I think time will show that “fractured fairytales” is a genre, not a bandwagon. But do me the favor of opening up the old storybooks and telling your kids about those stories first. It’s okay, the DVD will be waiting for them when they’re ready! This entry was posted on Saturday, May 19th, 2007 at 11:02 am. You can follow any responses to this entry through the RSS 2.0 feed. You can leave a response, or trackback from your own site. It’s actually something I’ve been thinking about a lot. 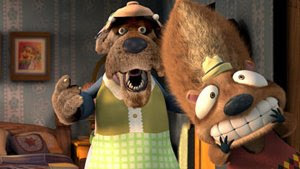 My 3-year old loves the Hoodwinked “music videos” (we watch the extended versions of the song sequences), but even though there’s nothing offensive about the film, I don’t want him to watch it until he knows the story it’s based upon simply because I don’t think it will be as enjoyable without understanding the differences. And yes, I think it’s equally important to nurture a sense of wonder. There’s enough time to become analytical as he becomes older. This is also true with all the comic books and movies that come out as well. Batman Begins, Hulk, even Spider-Man sometimes, and many many other comic-to-film adaptions are always a step up into the “dark” and mature arena. These days I see kids wanting “Ghost Rider” action figures and dark monotonous characters like that to play with, when I probably recall in the past that the opposite was true. I don’t know, but I feel that there are less and less actual “kids” entertainment while everything is moving to a more “mature” level, and kids bite into that too… alot of kids shows (on Cartoon Network, etc.) are also deep in parody and have many not-very-childish jokes. Sorry, I may be off the point, but I think it does relate to this subject one way or another. Please keep in mind: that if you don’t understand what I was trying to say, that’s alright because I’m writing this on-the-fly and .. ohh never mind. I think you DO make a good point, Phil. Not only about how our pop culture is deep into satirizing itself, but also the derivitive nature of ANY art these days. MOST entertainment you see is based on something else. But I think most trends are like pendulums, and we may see it swing the other way with more desire for brighter stuff. Oh, I so hope you are right. We can hope. Present day fairytales are no more interpretations of “actual” fairytales than our generation’s watered-down Disney versions. What people are referring to as “originals” are actually far from. Read the original Hans Christian Andersen, et al stories. They are TWISTED, often gruesome tales with horribly sad endings. Fairy tales are borderline “oral tradition” material, ripe for reinterpretation as they are passed down through the generations. Have at ’em, say I.
I, personally, don’t see it so much as a battle between The Classics and The Reinterpretation so much as between Satire/Cynicism and Innocent Wonder. I vote for promoting innocence and wonder in children. They grow up too fast in today’s world as it is.